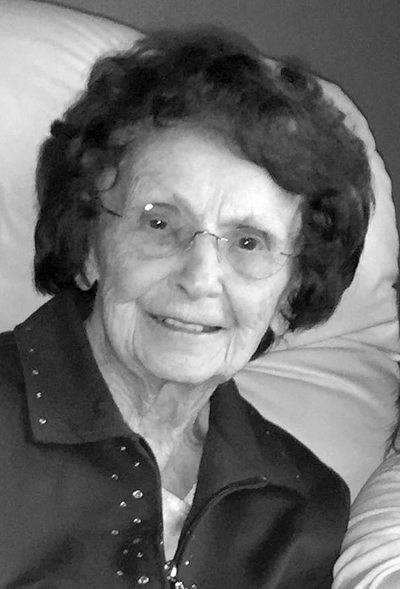 CRYSTAL FALLS — Geraldine A. Albiero, God’s good and faithful servant, 93, of Crystal Falls, passed away at home in the peace of our Lord on Nov. 8, 2017. She will always be remembered as a loving and caring wife, mother, grandmother, great-grandmother, sister, aunt and friend who shared her gift of faith with all. Geri was born in Iron River on Feb. 4, 1924, daughter of the Sebastian and Emma (Gendron) Taetsch. She grew up and attended Iron River schools. Geri married Angelo Albiero on Feb. 15, 1947, at St. Agnes Catholic Church in Iron River. Together they made their home in Crystal Falls and raised six children. The couple celebrated their 52nd wedding anniversary before Angelo preceded her in death on April 5, 1999. She was a member of Guardian Angels Catholic Church, where she served as a Eucharistic minister at the Iron County Medical Care Facility. She was a board member of St. Vincent de Paul Society, organized clothing drives for the needy in the Appalachian Mountains with her friend, Jackie Lesandrini called “Who’s My Neighbor?” Geri and her husband Angelo were the recipients of the Lion’s Club Citizen of the Year. Geri loved spending time with family and friends. She enjoyed traveling to new adventures or simply a road trip. She had a special love and faith for our Lord and shared that love and faith with all who were blessed to know her. Geraldine is survived by her sons, Ronald (Pat) Albiero and James (Diane) Albiero of West Bend, Wis.; daughters, Barbara (John) Allen of Niagara, Wis., Donna (Dave) Kyle of Marquette, Cindy (Joe) Hillier of Marquette, and Nancy (Ray) Niemi of Crystal Falls; a sister, Mary Jean Grindatti of Green Bay, Wis.; a brother, Donald “Bud” Taetsch of Iron River; sisters in-law, Gen Albiero and Dorothy Albiero of West Bend; 17 grandchildren; 20 great-grandchildren; as well as nieces, nephews and extended family. In addition to her husband, Geraldine was preceded in death by Taetsch brothers, Raymond, Robert, Herman and Carlyle “Nick”; brothers in-law, Victor and Frank Albiero, Maurice Grindatti and Jim Corbett; sisters in-law, Mary Corbett, Mary, Maria, Charlotte, Audrey and Elsie Taetsch. Visitation will be from 9 to 10:30 a.m. Thursday, Nov. 16, 2017 at the Nash Funeral Home in Crystal Falls. The funeral mass will follow at 11 a.m. at Guardian Angels Catholic Church in Crystal Falls. Fr. Daniel Malone will offer the Mass of Christian Burial. In lieu of flowers, donations may be made in her memory to the St. Vincent de Paul Society or Guardian Angels Catholic Church, both of Crystal Falls. Condolences to the family of Geraldine A. Alberio may be expressed online at www.nashfuneralhome.net.